Lucy Emily Woodruff Smith was the wife of George Albert Smith, eighth president of The Church of Jesus Christ of Latter-day Saints. They married on May 25, 1892, in the Manti Temple. A month after their marriage, he was called on his second mission to the Southern States. She was called a few months later to the same mission. Smith was the only general authority to have served with his own wife while serving as a proselyting elder, not a mission president. They worked together for a time as secretaries to the mission president, J. Golden Kimball. They later served together when he presided over the European Mission in Liverpool, England (1919–1921). Lucy was born on January 10, 1869, the daughter of Wilford Woodruff Jr. and Emily Jane Smith. Her mother died when she was nine years old, so she spent much of her time each day at her grandfather Wilford Woodruff’s home. 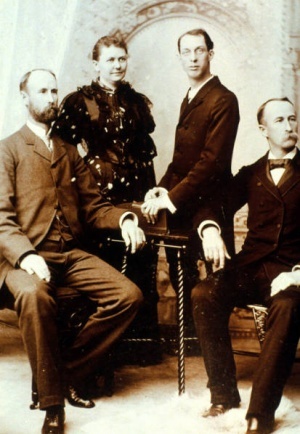 George Albert Smith’s family and the Woodruffs were neighbors, so Lucy and George knew each other since childhood. She attended the University of Utah for over a year and then received clerical training with the county recorder. She became expert at map making and record keeping. For a time she could not decide between George and another suitor, but she finally stopped her marriage plans with the other suitor and married George. They were the parents of three children. This page was last edited on 1 February 2017, at 14:32.